Adapted from the play “Max und Milli” by Volker Ludwig. Davy O’Leary is a little timid and feels tyrannised by his younger and more assertive sister Mary. Their father has deserted the family and they are being raised by a very caring, if overprotective, mother. Both children privately nurse fears of abandonment. Kevin is from the other side of the tracks. He acts tough and aggressive, and is frequently in trouble with his father and feels unwanted by his stepmother. After a few confrontational meetings in the playground the children form an unlikely friendship. 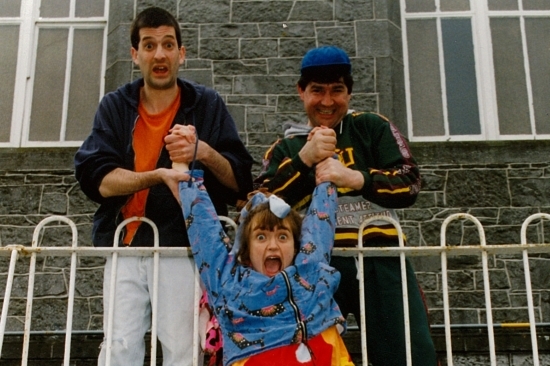 Davy and Mary try to help Kevin out when he loses money belonging to his father but this gets Davy in trouble at home. Out of loyalty to his pal, Davy is economical with the truth to his mother. This sows more confusion and gets both himself and Kevin into more trouble. The bond between the three children grows in adversity and they share their hopes and fears as they try to overcome their parents’ disapproval of this new friendship. A play for children aged 6 – 10 years.